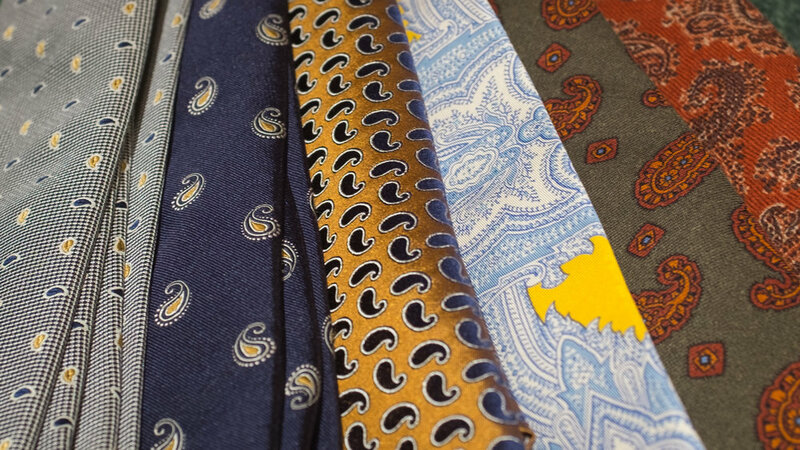 The first question a client often asks after we show a paisley necktie is whether they’re "back in style." In fact, a well-executed paisley is one of neckwear's most elegantly evergreen designs. An ancient pattern of Persian origin introduced to Europe by the British East India Company in the 17th century, paisley takes its name from a Scottish town that became a center of its production in the 19th century. Its feather-shaped curlicues are among the most whimsically organic design elements in the neckwear canon, but depending on its scale and complexity, paisley can be rendered into a tie anywhere on the formality spectrum. Below are a few examples drawn from our stock. Macclesfield Woven Silk Paisley - The paisley elements here have been abstracted to their geometric essence and reduced in scale to be subtle decorations on a woven black and silver field, making this is a very dressy tie intended to be worn with suits. Woven Silk Spaced Paisley - The modestly sized yet prominent paisley motif on a navy field gives this tie an almost crested effect, appropriate with either a suit or blazer. 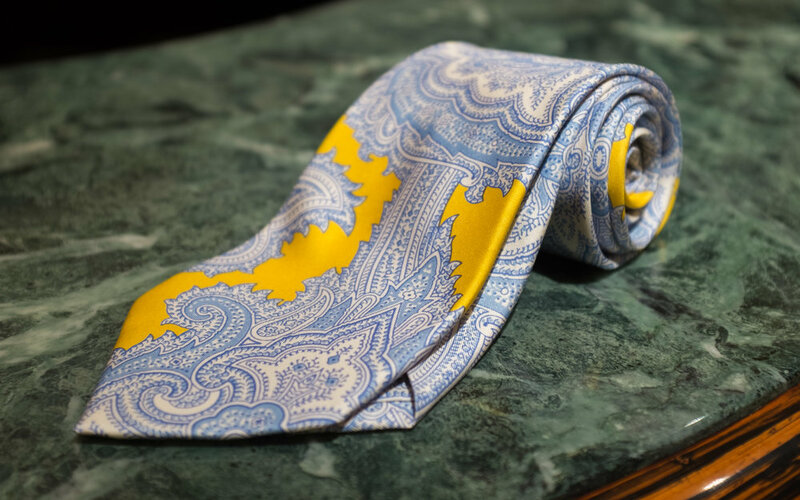 Woven Silk All-Over Paisley - A subdued navy paisley motif on a rich gold field makes for a chic tie, dressy but wearable with either a suit or a blazer. Printed Wool Challis Paisley - A rather traditional paisley of the type more commonly seen printed on ancient madder silk, the bold scale of the motif is tempered by muted autumnal colors, making it wearable with anything from a wiry tweed jacket to a flannel suit. Printed Wool All-Over Paisley - Although the paisley motif here is even larger and more ornate than the previous tie, a richly monochromatic palette renders this tie quite versatile and nearly as wearable as a solid. Oversize Printed Silk Paisley - Cut from a scarf-scale patterned silk, this blown up paisley affords the savvy a light hearted, blazer-with-khakis, lawn-party chic.